Over 500,000 men have attended an Iron Sharpens Iron Conference since the beginning in 2001 and there is a story behind every man each year. That’s 500,000 stories. We will continue by the Grace of God and your partnership to offer this unique resource of equipping men because we know and see that when you build godly men, everyone wins. Everyone means everyone – women, youth, children, church people, neighbors, co-workers, extended family and more. We remind the men at every equipping conference that changes begin with a decision. That decision is made at a time and place. Take a moment and read how Tim’s decision on April 11, 2015 at ISI in Albany continues to bear fruit to this day. Tim’s church had attended the Iron Sharpens Iron Regional Equipping Conference every year since 2005. It was a pretty big deal at his church and if his family calendar was free, Tim would join the men of his church at ISI. It was one of the most impactful days of the year for him and when he would occasionally travel Faith Baptist Church in Rexford throughout the year he would reflect on a specific memory from a specific conference that would change the way Tim saw the way the Lord viewed him and the way he saw himself. 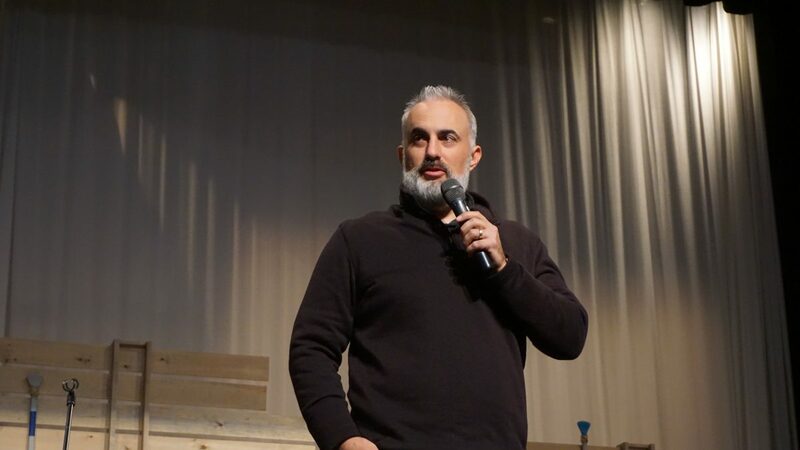 The Iron Sharpens Iron Conference was usually held at Loudonville Community Church but in 2015 it was being hosted at the Rexford Church and another area church in the Capital Region. Tim did not know most of the speakers at the conference but the seminar introduction by Stephen Kendrick on the topic of fathering really resonated with him. He knew that the Kendrick Brothers had created and produced the movie, ‘Courageous’, and Tim definitely wanted to be a better dad. His heart was tender for his kids but he just wasn’t sure how to best influence them to love God with all their heart. It actually seemed as though the older they got the less they were excited about God and church. It was the Afternoon Seminar at ISI that year that Stephen Kendrick shared about being God’s Man in the home and that a starting place was to meet with God every day by reading the Bible and praying. Stephen suggested doing this in such a way that the kids knew this was happening so that is what Tim did. Starting the very next day he began to read a chapter in the New Testament every morning and then pray for his Jan, his wife, their children, his pastor and friends at church and for those at work that he was hoping to influence. Tim did this every day for months and as the holidays came close the Lord reminded him that Stephen had shared how after he had developed his own spiritual discipline of meeting with God, he asked his family to join him in reading the Bible. Tim and his Jan decided that Tuesday and Thursday dinners worked for their family schedule so Tim began to open up the Bible and read a chapter from the Books of Acts. This action-packed book of the Bible provided great stories of the early church and seemed to keep the kid’s attention. Tim didn’t prepare much for this – he just picked up where they had left off the time before. As they planned for Christmas morning, Tim shared with Brian Doyle of Iron Sharpens Iron that he and Jan were going to make a big deal of the Christmas Story from the Bible this Christmas before they opened any presents. He did not know if Stephen Kendrick did this but thought that he might. In fact, Tim shared with a couple guys at the church his plans for Christmas morning and they were going to try reading the Christmas Story from the Bible as well. For many years, Tim was a good man who attended a good church and lived a good life. The Iron Sharpens Iron Conference on April 11, 2015 changed all that. It was here that Tim stepped into his God-appointed role of being the spiritual leader of his own home. He was exhorted, he was encouraged and he was equipped. Would you join us and become a ministry partner as we prepare for our 19th year of this very unique conference ministry of equipping men in the Northeast and across the nation. © 2018 Iron Sharpens Iron. All Rights Reserved.